Win a $50 Gift Card for the Carolyn Cochrane Etsy Shop! - A Life From Scratch. 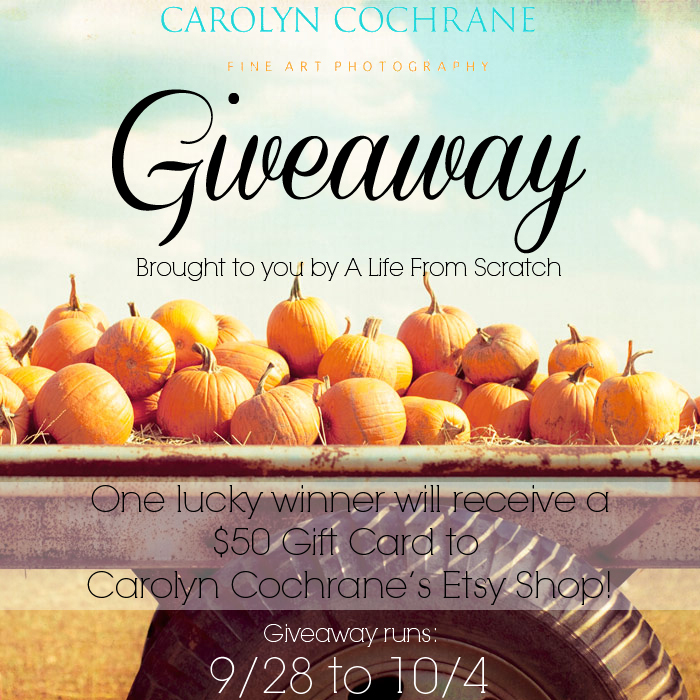 Win a $50 Gift Card for the Carolyn Cochrane Etsy Shop! Gosh, I am such a sucker for Etsy. Rightfully so though. I mean, have you spent time on there? Recently while looking for some peaceful ocean images for a friend, I stumbled upon Carolyn Cochrane’s darling little shop. Well, not little I guess. The girl has 721 five star reviews. Not too shabby. And I’ll make that 722. Her customer services was awesome. She was prompt, helpful, and totally into her beautiful work. So I asked if we could team up for a giveaway for my blog followers, and I got a very enthusiastic “YES!” Yippee. 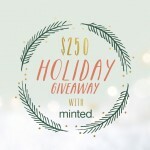 So, what’s in it for you… how about a chance to win a $50 gift card towards anything in her shop! This pumpkin print is totally calling my name… so dreamy. For a bonus entry, be sure to visit her shop and then come back here and leave a comment, letting me know what you’ll purchase if you win the giveaway! Just be sure to get entered by this Sunday night, October 4, at 11:59pm EST. The winner will be randomly selected (and entries will be verified), and then announced on Monday over on my Facebook page. Be sure you’re following me there so you don’t miss out! The fine print: No purchase necessary. Giveaway is open to entrants worldwide, except where prohibited by law. Giveaway will run from September 28 through October 4, 2015 at 11:59pm EST. One (1) winner will be randomly selected and once verified, will be notified via email. Winner will have 48 hours to claim their prize; failure to do so will result in forfeiture of the prize. Facebook, Twitter, and Pinterest do not sponsor, administer, or endorse this promotion. 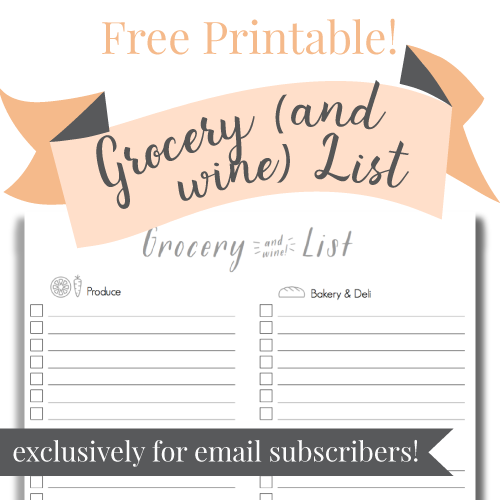 By participating in this promotion, entrants give their permission for their email address to be added to the A Life From Scratch newsletter list. GIVEAWAY with Between YouandMe Signs! 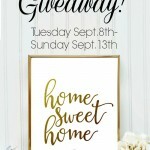 Home Sweet Home – giveaway! The sailboat photography would look fabulous in my guest bedroom! Such beautiful photos, I want to choose fifty of them! I already subscribe to your email newsletter, but I signed up for hers too – wow, gorgeous work! I’d probably pick the Teal Brown Print Set – turquoise beige cream aqua 9 nature photographs set of nine modern gallery wall colorful photos botanical photograph. I think I would put this one in my living room so I could stare at it during winter months! I also love the bowl of oranges for our kitchen. 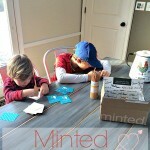 Kelly recently posted…Win a $50 Gift Card for the Carolyn Cochrane Etsy Shop! I will definitely check out her shop. I try to support as many businesses on Etsy as possible. Wow – her work is really beautiful and I love buying from Etsy! I’m’ going to look at more of her shop now. 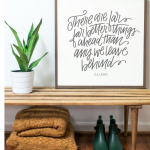 She has some really beautiful prints in her shop. I love the beach print set. Just gorgeous! Sounds like this is my chance to get sucked right in to Etsy! I love her prints! So hard to choose! The pumpkin print is gorgeous! And I love that you’re the 722nd positive review. Maybe I’ll be 723! Tamara recently posted…Halloween Traditions With Nestlé . I have the perfect place for them too! I love Etsy. It looks like she has a cute shop! I love Etsy there are so many one of a kind items on there that you can easily get lost. I’ve visited Carolyn Cochrane’s shop a few times and will be back at the end of the year to make my first purchase. I agree with your point .. the best brand is the one that “agrees” with the Dog. There has been times when I’ve tried to name brand s and they lead to allergies and I’ve tried less expensive brands and they work so well. Hurrah that she agreed to partner up. She does have lively items. Ooh I’m going to have to check out her shop. I’d love to look at some of her art. I just checked out her shop and I am in love with the beach prints. The colours are so vibrant. I would love all of the prints! I admit I am an Etsy addict for dog items – I love cocker spaniels and get my fix there. Thanks for the heads up on this beautiful store. I will check it out. It is always great to find a new small business to support. It is even better to see those businesses grow. I love shopping on Etsy! 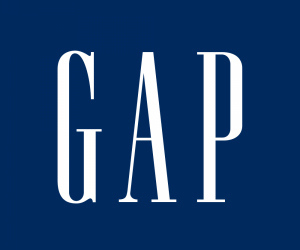 My most favorite site to purchase things from. I love shopping Etsy – items that are unique and original. This would make a great holiday gift. I will definitely check it out. I love checking out as many new businesses on Etsy as possible, after all, I love shopping! What a cute shop with so many gorgeous images. Now I want to go shopping!! Jamie recently posted…Mad for Plaid with LISTERINE®! I would get the Bird Photography for the TitMouse or the Oh Little Bird; love those two.